I have been having a relatively quiet week enjoying the simple things in life as my back has still been a bit sore. Have enjoyed long soaks in a nice hot bubble bath and the relief of getting home after a day’s teaching to lie on the sofa with my knitting. 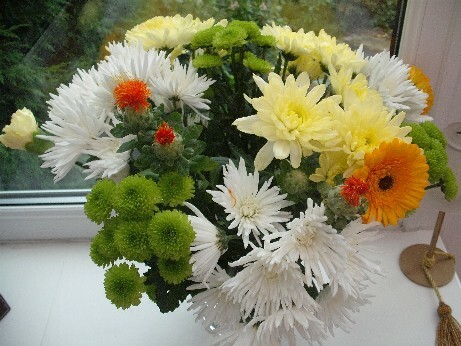 My lovely students bought me a big bunch of flowers as a get well present – aren’t they kind? I have taken delivery of a new edition of one of my recent magazine subscriptions this week so I thought I would share this with you. 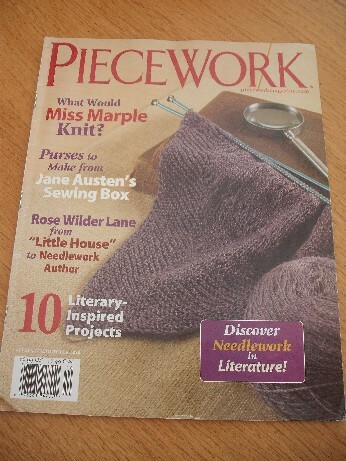 The magazine is called Piecework and it comes from the USA. I subscribed a few months ago as I liked the fact that the magazine is a blend of the history of all sorts of crafts and ideas for making new items. Each magazine contains articles and then a project and covers embroidery, knitting, crochet, weaving etc so is perfect for me. I probably won’t get around to making any of the projects anytime soon (due to life interrupting the serious business of playing with textiles!) but love reading them. 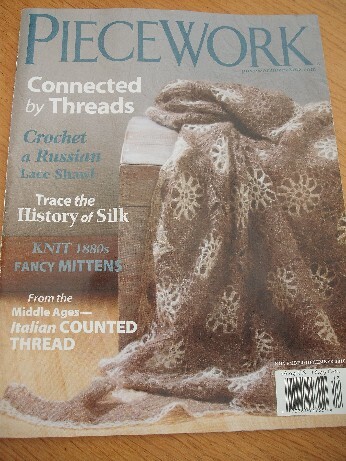 My favourite from this issue was the article on one woman’s grandmother’s crocheted pillow edgings. 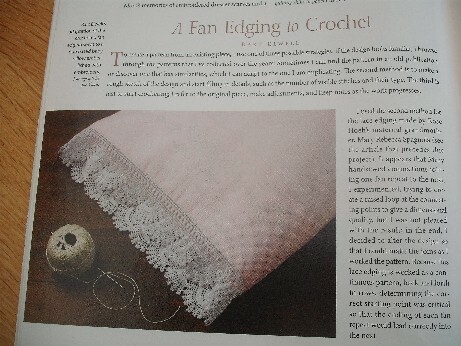 As regular readers know I love the social history behind textiles and this was a really interesting article with a crochet pattern to go with it – I wish I could crochet but even if I could I think this would be beyond me! 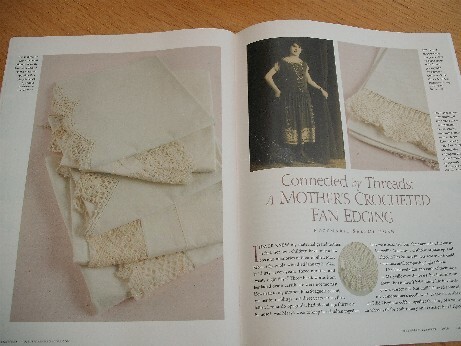 Last edition was all about the links between literature and textiles and include an article on one of my favourite subjects. 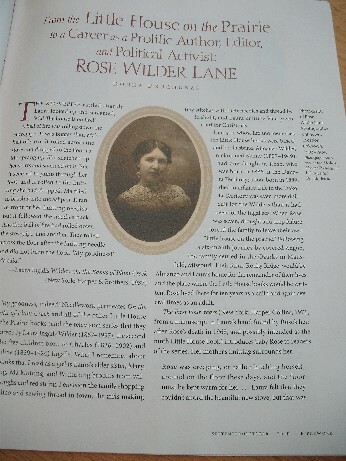 I have been re-watching Little House on the Prairie and reading lots about Laura Ingalls Wilder and her life after the books ended and there was an article about her daughter Rose Wilder Lane. My friend Kath lent me two books about Rose’s childhood which I read on my recent holiday in Spain. She had a very similar upbringing to her mother in small rural communities but ended up becoming a journalist and travelling all over the world and writing about women’s needlework as well as travel and industrial change. It was she who encouraged her mother to write all the Little House books. I find their stories fascinating as a record of how the roles of women changed so much in that era. I have one of Rose’s books on my wish list for Xmas – the ‘Women’s Day Book of American Needlework’ and if no-one buys it for me I will treat myself in Jan! I am getting on well with my quilted Xmas wall hanging and my lace pattern scarf – no finishes to show you yet but they will be done soon! The lace scarf is a real labour of love as it has a 12 row pattern which takes lots of concentration but I am nearly there! I do have a pic of the latest baby cardigan in Sublime with its recipient. 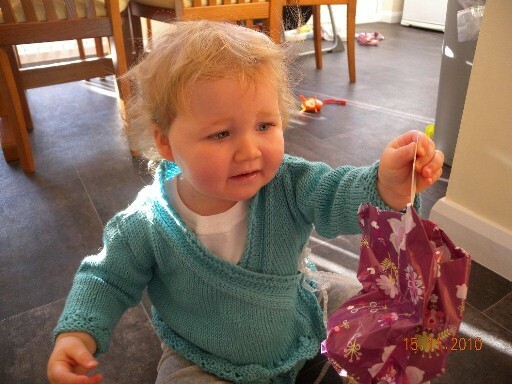 Here is Anna – Mae with her parcel and wearing the cardigan – doesn’t she look lovely! I am so glad that it fits. She is now nearly 18 months old - isn't she adorable!